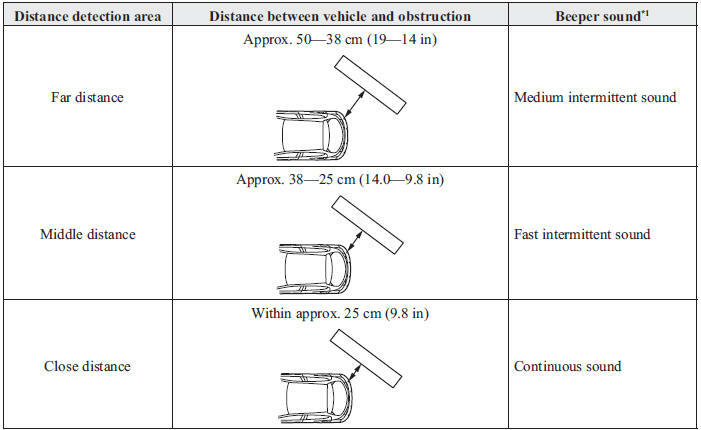 The parking sensor system uses ultrasonic sensors to detect obstructions around the vehicle while parking the vehicle in a garage or during parallel parking when the shift lever is in reverse (R). The system is equipped with an assist device to notify the driver of the approximate distance from the vehicle to the surrounding obstruction using a beep sound. Do not rely completely on the parking sensor system and be sure to confi rm the safety around your vehicle visually when driving. This system can assist the driver in operating the vehicle in the forward and backward directions while parking. The detection ranges of the sensors are limited, therefore, driving the vehicle while relying only on the system may cause an accident. Always confi rm the safety around your vehicle visually when driving. Do not install any accessories within the detection ranges of the sensors. It may affect the system operation. Depending on the type of obstruction and the surrounding conditions, the detection range of a sensor may narrow, or the sensors may not be able to detect obstructions. Mud, ice, or snow is adhering to the sensor area (Returns to normal operation when removed). The sensor area is frozen (Returns to normal operation when the ice is thawed). The sensor is covered by a hand. The sensor is excessively shocked. The vehicle is excessively tilted. The vehicle is driven on bumps, inclines, gravel, or grass covered roads. Anything which generates ultrasound is near the vehicle, such as another vehicle's horn, the engine sound of a motorcycle, the air brake sound of a large-sized vehicle, or another vehicle's sensors. The vehicle is driven in heavy rain or in road conditions causing water-splash. A commercially-available wing pole or an aerial for a radio transmitter is installed to the vehicle. The vehicle is moving towards a tall or square curbstone. An obstruction is too close to the sensor. Always have the system inspected at an expert repairer, we recommend an Authorised Mazda Repairer if any shock is applied to the bumpers, even in a minor accident. If the sensors are deviated, they cannot detect obstructions. The system may have a malfunction if the beep does not operate. Consult an expert repairer, we recommend an Authorised Mazda Repairer. The beeper which indicates a system malfunction may not be heard if the ambient temperature is extremely cold, or mud, ice, or snow adheres to the sensor area. Remove any foreign material from the sensor area. When installing a trailer hitch, consult an expert repairer, we recommend an Authorised Mazda Repairer. The sensors detect obstructions within the following range. When the ignition is switched ON and the shift lever is shifted to the reverse (R), the beep sound activates and the system is enabled for use. The beeper sounds as follows while the system is operating. *1 The rate at which the intermittent sound beeps increases as the vehicle approaches the obstruction. If an obstruction is detected in a zone for 6 seconds or more, the beep sound is stopped (except for the close-distance zone). 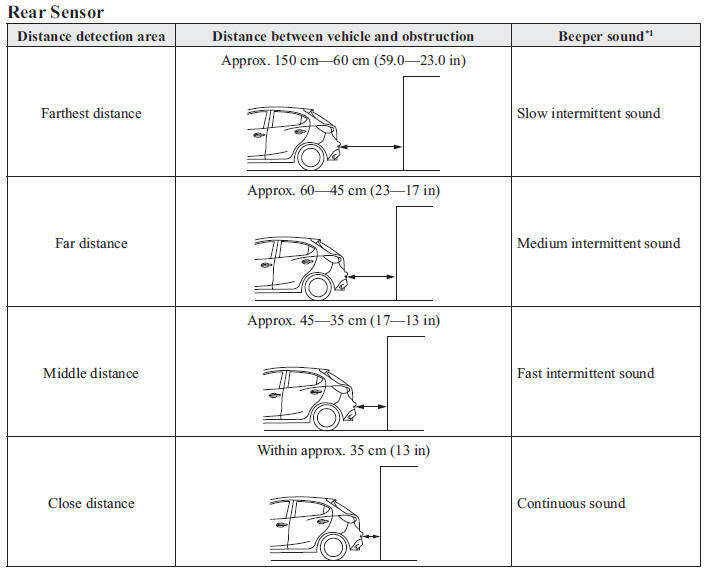 If the same obstruction is detected in another zone, the corresponding beep sound is heard. The system notifi es the driver of an abnormality by activating the beep sound and the indicator light. The beep sound is not heard. The system may have a malfunction. Have the vehicle inspected at an expert repairer, we recommend an Authorised Mazda Repairer as soon as possible. The intermittent sound of the buzzer is heard fi ve times. Remove any foreign material from the sensor area. If the system does not recover, have the vehicle inspected at an expert repairer, we recommend an Authorised Mazda Repairer.